First, you need to create a Get It Done account and sign in: http://getitdoneapp.com. 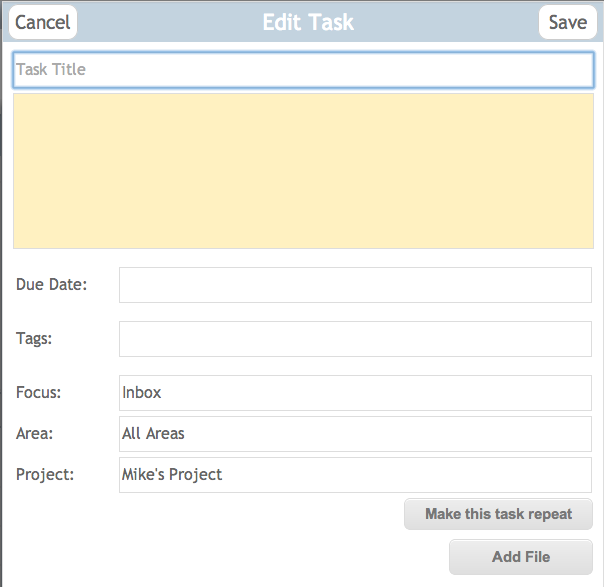 After you’ve set one up and logged in, there are 3 ways to add tasks in Get It Done. 1. When you are in the application, just type in the “Quick Add” field at the top right corner of the window. When you’re done typing, just press “enter” or “return” key and it will be added for you. If you are already in a particular tag, then the task will get added with this tag. This is a great way to clear your head of all your tasks very quickly and easily. 2. Alternatively, you can click the “+” button at the bottom right of your window. This will give you more options like tags, attach files, due date, and more. 3. The third way (and our favorite way) is to email tasks to Get It Done. 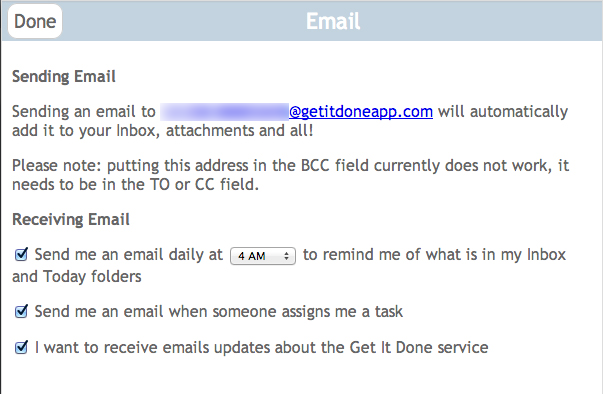 If you go into your settings link located at the bottom left of your window, then click the ‘Email’ button you will see your unique @GetItDoneApp.com email address. I suggest you put this address in your address book so that any time you get an email which will require your attention, you can simply forward the message to your unique Get It Done email address and we automatically add the task for you (attachments and everything)! Area or Responsibility: use the "@" sign. For example if you write in the subject of the email "Take out the garbage @home" we will add the task to your "Home" Area of Responsibility if one exists. Focus: use the "#" sign. For example if you write in the subject of the email "Take out the garbage #Today" we will add the task to your "Today" folder. If you do not put in a focus we automatically put all email in your Inbox. 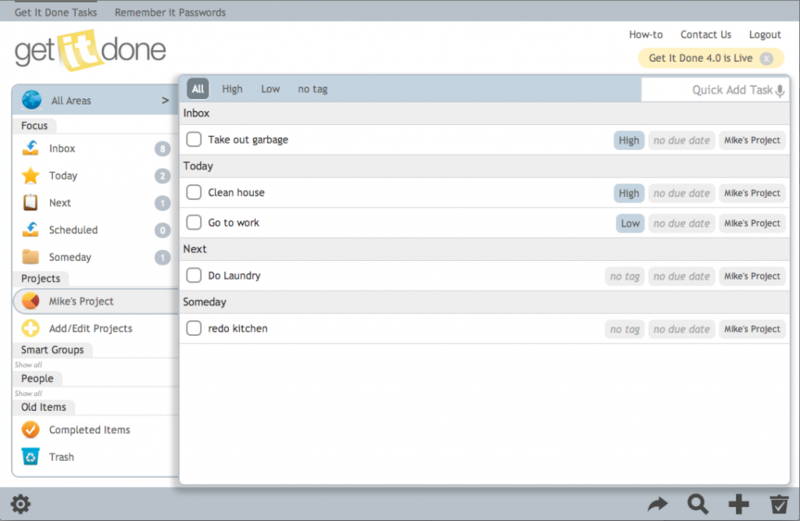 You can also put the task in #Next or #Someday folders. Tag: use the "%" sign. For example if you write in the subject of the email "Take out trash %high %home" we will create a task with the tags "High" and "Home" if those tags already exist. If your Area or Tag has 2 words in it just put quotes around it like this: %"High Priority"